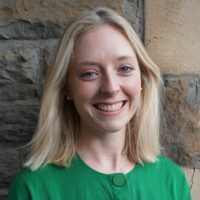 Emma is Senior Research Officer at the Wales Centre for Public Policy and the Alliance for Useful Evidence, leading research and engagement projects that champion the use of evidence in social policy and practice, with a focus on Wales. Her current projects include a study exploring the views of local government leaders in Wales on austerity, an ESRC project to share learning between What Works Centres, and a report on how charities use evidence. Prior to this, Emma was Research Associate at the University of Birmingham, seconded to Step Up To Serve, the charity running the #iwill campaign. Her most recent project explored what a habit of social action looks like for young people in the UK. Emma’s background is in the charity sector, having worked for WE and English PEN, as well as for think tank Credos. She has a first class BA (Hons) in History from the University of Warwick. Emma’s major research interests include qualitative methods, inequality, third sector research, volunteering, and feminism.